How many times do you need something Christmassy before Christmas? 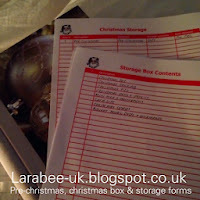 This year there were lots of things that I needed from about September, long before I actually got all the Christmas supplies down from the loft! For example, in September I wanted to take T's Christmas photo for a review I did for picstick, do you think I could find a Christmas hat or a Christmas t-shirt or even some Christmas pj's? In the end I went in the loft and managed to drag a stocking and pj's out of a box without disrupting too much, but that was shear fluke! Then when I wanted to take some pictures for a blog project and wanted a Christmas tree 'prop', nothing to be seen, everything buried within one of the 11 boxes of Christmas goodies in the loft, yes all neatly numbered and labelled and contents written on lists so I knew what was in where, but everything I needed was in different boxes. So I've decided that when I put everything away in storage again I will have a 'pre-christmas Christmas box' containing all those Christmassy things I need before christmas! As I mention above, I already use some forms to record what's in which box, but I'll just make sure that everything I need before a Christmas is together. I hope you find this list helpful, what things do you need ahead of time? It's certainly going to be easier for me to grab this box before the rest of the boxes make their way downstairs and pop back when I'm done.